Despite my feelings about the ME3 ending, I picked up Mass Effect: Andromeda last night. Here are my initial impressions from about an hour of play. I usually don't pay attention to internet complaints about graphics. To my non-artistic eyes, pretty much every modern game looks good. However, the facial animations in ME:A are horrifically bad. Lips move, but the entire rest of the face has been botox-ed into immobility. My current head-canon is that it's a side-effect of the cryogenic sleep process, and everyone's face has simply not thawed yet. It looks really terrible, and is extraordinarily distracting. I'm playing with the default Sara Ryder, and her eyes have pupils which are not centred correctly. It looks like she constantly has her eyes half-rolled up. The biggest problem, though, is that's there's a clear mismatch between the quality of the head model, and the quality of the animations. This actually makes the problem worse. Maybe if the models hadn't been aiming for "realistic" so hard, the animations wouldn't stand out so much. ME:A graphics spiked in quality the moment the characters put on their helmets. Now, that being said, perhaps you get used to it. It wasn't nearly as distracting at the end of my play session. The story is just starting up. It's interesting how they leave everything from the original series somewhat ambiguous. In some ways, it's like the story is set in Mass Effect universe, but ignores the plot of the Mass Effect games. So far, the writing is okay. It's not good, but it's not bad either. It kind of reminds me of a author with potential writing her first novel. It could get a lot better, but it might not either. One interesting thing Bioware has done in conversation this time around is to categorise responses as either emotional, logical, casual, or professional. It's a very explicit way for you to define your character, especially as not all choices have all options. Sometimes you have to decide between emotional or logical. But other times, you might have logical versus professional. My tentative feelings on this system are positive, as it provides a nice framework for choices. As a side-effect, options which are purely informative are also labelled, so you can go through all those without accidentally making a true choice. Now we get to the outstanding part of the game so far. The combat is excellent so far. Powers work well. The shooter mechanics are crisp and nice. I'm probably going Tech/Arms, and the tech powers are interesting, and combo nicely with each other. There's a lot of powers and skill trees for RPG enthusiasts to enjoy. Combat feels good in this game, and that's a major positive for the game. When you think about it, the facial animations are probably disproportionately distracting. But I can guarantee you that it's the first thing you notice when you start playing the game. The story is very generic at the moment, but hopefully the writers hit their stride and pick it up as the game goes on. But the combat mechanics are quite fun and well done. If you've been following the top guilds and the World First races in WoW, you'll notice that a lot of the top guilds have been calling it quits. I think the higher-than-normal burnout has two intertwined causes, and it's hard to propose solutions without understanding those causes. First, I don't think the long hours during the race itself is an issue. The world-first guilds have always raided intensely during the first couple of weeks. Ciderhelm talked about it in his guide to Time Management way back in Vanilla/TBC. You raid intensely for two week, and then have a very relaxed schedule for the next four or five months. The current issue facing edge guilds is that to be competitive, each raider needs multiple "finished" characters. First, the multiple part. Edge raiders need multiple characters for split runs as well as to swap characters around to have an optimal setup. There's always been a degree of this in WoW, but the number of characters needed has steadily increased. I believe that edge raiders are now expected to have four or five characters they can switch to for progression. Second, the "finished" part. A finished character is one which is fully geared and maximized from the previous tier. This is the major change in Legion. Before Legion, it was fairly easy to finish a character, especially if you were in a guild which regularly cleared Mythics. But Legion increased the amount of work to finish a character significantly. Now you need Best-in-Slot legendaries, maximized Artifact Power, and Warforged/Titanforged gear to be truly finished. Now, this is actually great for those of us who play one main character and aren't at the cutting edge. There's always the chance of upgrading. Maybe you'll get a titanforged piece, or a new Legendary. I've only got 40-something points in my Artifact Weapon, so more AP is always useful. However, for the edge raider, this is murderous. 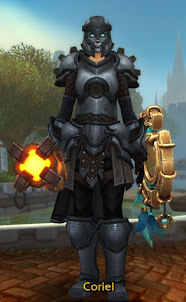 Where Ciderhelm once touted a intense two weeks, then a relaxed schedule for 4 months, the modern edge raider spends all her time trying to finish her character, chain-running content for AP and the chance of titanforged gear. And due to the first requirement of needing multiple characters, she has to do this on four or five characters. No wonder they are burning out. The big problem, of course, is that the longer path to finishing a character is excellent and enjoyable for the vast majority of the population, even if it is burning out the edge raiders. In the next post, we will look at potential solutions. Magic: the Gathering has several constructed formats. The flagship format is called Standard, and basically consists of all sets released in the last couple of years. As new sets are released, older sets rotate out, so the pool of cards from which to build decks changes regularly. Lately, the Standard environment has had a lot of issues. Earlier this year, WotC banned 3 cards, the first time cards have been banned in around five years. And even after that, the resulting environment is not perceived as healthy, and there are calls to ban more cards. Right now, WotC really has only one way to affect the Standard environment: banning cards. New sets in the pipeline have already been finalized. Changes made to sets in production won't show up for over a year. I propose that WotC add a new Virtual Core Set for Standard. This would be a list of already printed cards from older sets which are now legal in the current Standard. I envision a starting list of about 50 cards, 10 from each color, which are "staples" of traditional Magic. The Core Set would not be cards that you build a deck around, but be mostly utility and sideboard cards to help weaker decks challenge the stronger ones. Not the stars of your deck, but role-players. "Engine" cards, finishers, and "flashy" cards would come from the current sets in print. This would provide a second, less-drastic mechanism for tuning Standard. Instead of the only option being to ban or not ban cards, WotC could first try adding or removing cards from the Virtual Core Set. If Standard needs a little more graveyard hate, rotate in some more graveyard hate. This would allow WotC to add cards to Standard without affecting Limited formats. This allows WotC not to have to worry damaging a good Limited environment by reprinting a strong card meant for Standard. Allows WotC more breathing room when it comes to reprints. Sometimes reprints are necessary, but don't fit in the set thematically, or have to replace a new card. This avoids that issue. Cheap. There used to be a Core Set made up mostly of reprints. But since most players already had the cards, and the Core Set was at a lower power level, it didn't sell well. A simple list of allowed cards has a minimal cost, in contrast. There should be a healthy supply of most cards that would be in the Virtual Core Set from previous sets. I think a Core Set would provide a stronger "baseline" for Magic in Standard. There would always be a little counter-magic, a little burn, etc. that adds additional support for the main themes from the released sets. Standard legality becomes more complex. Right now, it's just cards in the legal sets minus a handful of banned cards. Standard would become cards in the legal sets plus cards in the Virtual Core Set minus the banned cards. Depending on how often the Virtual Core Set changes, keeping track of whether a deck is legal or not would become harder for more casual players. Virtual Core Set cards might oppress or crowd out new cards. 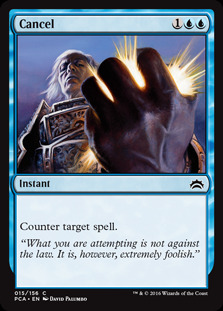 For example, let's say Counterspell was added to the Virtual Core Set. Obviously it would displace any counters from the new set, and may end up killing whole potential strategies. Well, last month was pretty much a bust as far as blogging goes. Hopefully, I will do better this month. My guild slowly moving through Heroic Nighthold. I think we're 5/10 now. Our biggest enemy, really, is time. We're a 2-nights-a-week guild, but we spend the first night on Normal Nighthold. So we don't really get a lot of time in on the current boss. But so far it's been steady progress, killing a new boss each week. I have my 4-piece set bonus, so I'm pretty set. Otherwise, not a lot is going on in WoW. I leveled a Demon Hunter to max and finished that story line. It was perfectly fine, but there's just something about the demon hunter mechanics that I can't warm to. I'm not really sure what it is, but I just don't enjoy demon hunter combat. It may very well be that demon hunters are too mobile for me. I haven't been playing FFXIV a lot. I've done the latest 24-mans, and they're fun. I still have one 8-man trial to go. Otherwise, I've been kind of down on FFXIV. I play a tank in that game, but I don't like large pulls or speed runs. However, the community seems to expect speed runs in all content lately, and the dps have taken to pulling for me. It's an interesting contrast to WoW. In WoW, the "go-go-go" crowd is segregated into Mythic+ dungeons. I haven't done a single Mythic+, and any regular mythics or heroics I do are nice and relaxing. But in FFXIV, you're expected to do a wide variety of roulettes each day. On the one hand this is good because it keeps queues hopping, and sends veteran players back to help newbies. On the other hand, that means the veteran playstyles dominate all facets of the game. Tanks are expected to speed run and pull big. Healers are expected to switch to cleric stance and do damage. There's really no room to play in a more relaxing fashion if you prefer.